AP Polycet 2019: Application Form, SBTET Notification, Dates AP POLYCET 2019 POLYCET AP Web Portal http://appolycet.e-pragati.in/ : AP Polytechnic Entrance Test 2019 Exams Schedule notification released and Apply Online. AP POLYCET 2019 Exam date released, check out the schedule at polycetap.nic.in. The AP POLYCET exam date for the Andhra Pradesh Polytechnic Common Entrance Test (POLYCET) has been released by the AP SBTET . All those who are interested in the same are required to get themselves registered at the official website appolycet.e-pragati.in/ from March 7th. The exam is scheduled to be conducted on April 12 from 11 am to 1 pm. 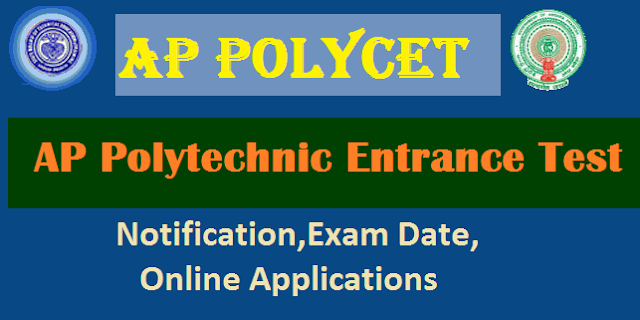 POLYCET is a Polytechnic common entrance test conducted by State Board of Technical Education and Training, Vijayawada for admission into engineering/non-engineering diploma level programmes conducted in government, aided, private, un-aided polytechnics and second shift polytechnics run in existing private un-aided engineering colleges. AP POLYCET 2019 Notification, Schedule for AP Polytechnic Entrance Test 2019, Online Application Form, Last Date, Exam Date, How to Apply, Hall Tickets, Results, Admission Counselling Details are given here. Aspirants should have passed SSC examination conducted by State Board of Secondary Education, Andhra Pradesh/Telangana or any other examination recognised as equivalent thereto by the Board of Secondary Education, A.P/TS such as CBSE, ICSE, NIOS, AP Open School Society (APOSS), 10 class examination conducted by various state boards of secondary education in India with mathematics as one of the subjects, and obtained at least 35 per cent marks in the qualifying examination. Those who appeared or are appearing for SSC or equivalent examination being held in March/April-2019, and whose results are yet to be declared can also apply. The duration of the exam will be two hours. There will be only one paper as per the syllabus in the subjects of mathematics, physics and chemistry of class 10 (SSC) examination. State Board of Technical Education and Training, Andhra Pradesh, Hyderabad has made arrangements to file online applications at various AP online/TS Online, Helpline centres/ through payment gate way. The detailed list of these centres is available at http://sbtetap.gov.in website. In order to file application through these centers a filing fee of Rs.400/- (Rupees Four hundred only) (Excluding Application Cost) has to be paid to the operator by the candidate. The application fee can be remitted through online/mee seva/payment gateway/net banking/Help line centers (Polytechnics). The application fee is Rs. 400/- for every candidate. Step 2: Search for Application Form for APPOLYCET click on that. Step3: enter your details 10th class hall ticket number, year of passing, date of birth, Candidates name, father name, date of birth. Address for correspondence another number, house number. As per the official exam schedule, the online application process for AP POLYCET 2019 is scheduled to begin on 19th March 2019 and candidates must apply before the due date 13th April 2019. The examination day for POLYCET 2019 is 12th April 2019 and the exam will be conducted from 11 am to 1 pm.